Trains and camera pictures are closely related. 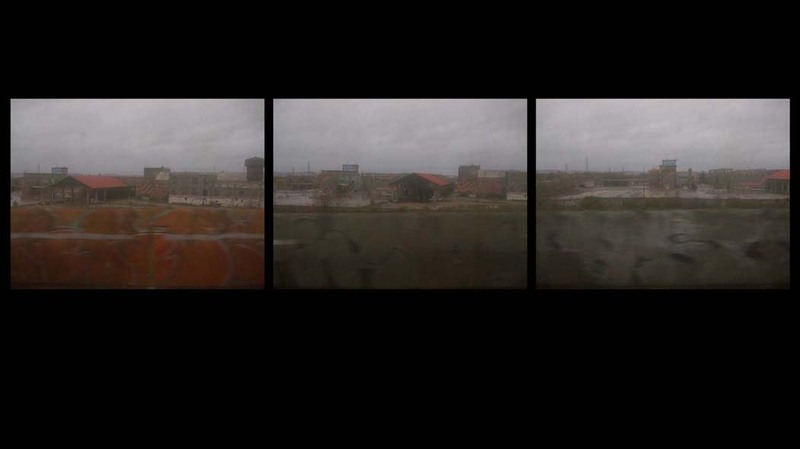 In a train, the window frames a landscape that, although random, is predictable, and although fixed, is moving. Conversations and sounds inside the carriage mix with the roaring and knocking wheels in a short and repetitive sound track for a film, vanishing and reappearing, always different yet similar. Something is happening, when nothing is happening. The destinations of all trains define a dramatic genre, which is the genre of deception. Among trains, the commuter train figures the film noir. The landscape is often absent, hidden, or shown as a metaphor of the blackness of souls and poverty. It is an abandoned landscape, come down in the world, an extension of the wild and forlorn strips of land that border the tracks, prolong the platforms and the stations. 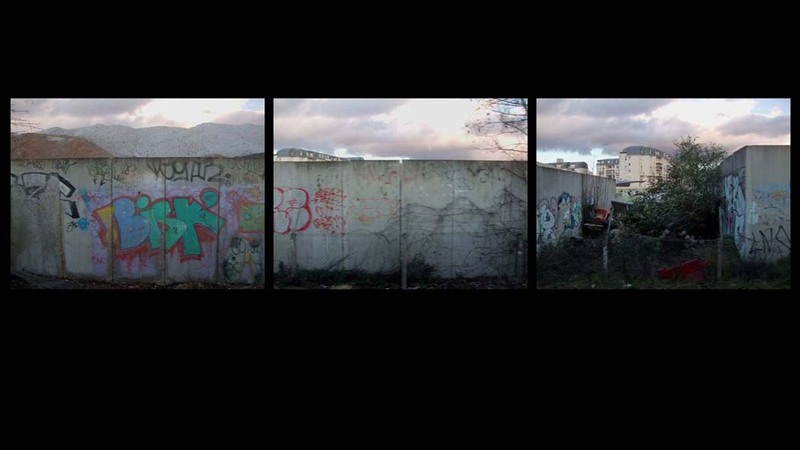 Marie Combes’ work here gives back an image to these picture-less landscapes. The shots reconstitute an interrupted movement. The polyptic pictures reanimate a voyage from movements without perceptible qualities. As in these commuter trains, the landscape is intermittent, masked by tunnels or walls, the fictions proposed are brief forms. 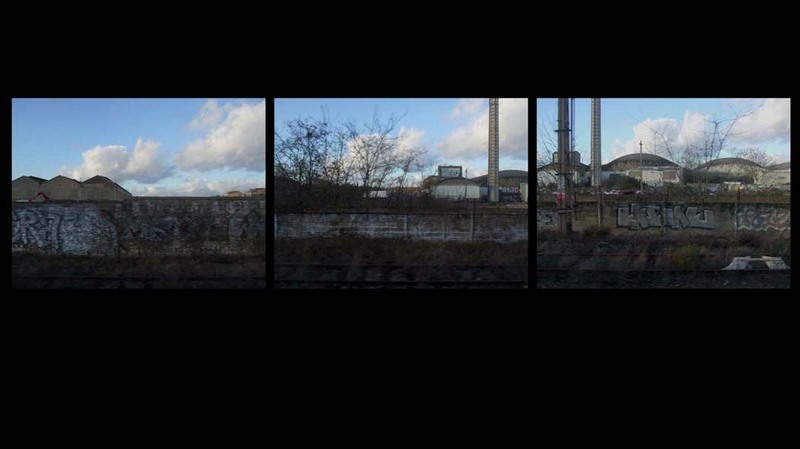 The landscape flashes by, sudden and bedraggled, underlined by the sour comment of the train, screaming through the grey air. Voyages with no departure and no arrival gave these images and sounds, which clothe in a new dignity lands that were disrupted, lands without grace but not without a soul. Work in progress The photographic and acoustic approach is central to the project implemented, and this work on images, texts and sounds is an exploration of a territory indistinctly named « suburbs », made fuzzy to remain anonymous, criss-crossed with production infrastructures, rotted in patches by abandoned interstices.